Ships visiting China's Yangtze Delta will need to burn bunker fuel capped at 0.5% sulfur fuel from the start of next month. 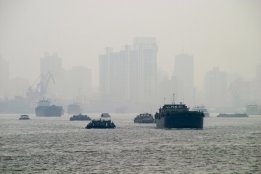 The Yangtze Delta is one of three emissions control areas (ECA) on China's southern coastline. Ships at berth in the delta's ports must switch to 0.5% sulfur fuel while the extension of the rule to include waters beyond the ports was to start from the beginning of 2019. That start date for 0.5% sulfur fuel remains in place for the Pearl River Delta and Bohai-rim Waters ECAs. Scrubbers or exhaust emissions abatement technology are also acceptable. The updated timeline for the change was reported by protection and indemnity club Gard. Solving fuel quality disputes can be complex, costly and time consuming, says Gunnar F. Lindqvist. As part of a plan to collaborate with other industry players.